Can You Guess The Film From Its Famous Quote? 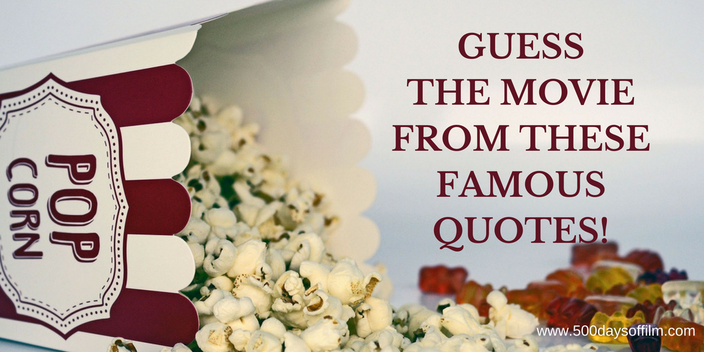 500 Days Of Film Reviews 50 Top Movie Quotations And Challenges You To Guess The Movie They Are From! I end each 500 Days Of Film Newsletter with a quotation from a new or classic film. As the weeks have gone by, I have amassed quite the collection of movie quotes. So, time for a bit of fun! What Films Do These Quotes Come From? "Hey, pretty girl. Time to wake up." "There may be something there that wasn't there before." " Rose, the keys... Just get the keys!" "Separate and equal are two different things. Just 'cause it's the way, doesn't make it right, understand?" "Hello Mark. So, what've you been up to... for 20 years?" "No woman can truly love a man who listens to Phil Collins." "I didn't choose the skuxx life, the skuxx life chose me." "If you wear a dress and have an animal sidekick, you're a princess." "Sigourney Weaver is going to help us!" "When you love someone, you have to be careful with it. You might never get it again." "Now that’s a proper introduction." "Now Sid, don't you blame the movies. Movies don't create psychos. Movies make psychos more creative!" "Anything can happen if you let it." "My Daddy tames the dinosaurs." "I can't go back and keep making the same mistakes when I can make new ones!" "That's some bad hat, Harry." "Some might say I couldn't sing but no one can say that I didn't sing." "Look inside yourself and recognize that change starts with you." "I'm not sure I agree with you a hundred percent on your police work there, Lou." "Everyone's obscene, that's the whole point!" "I've been ready. My safe word is 'keep going'." "Mama says, 'Stupid is as stupid does'." "Go to the Winchester, have a pint and wait for this to all blow over." "Now you're looking for the secret, but you won't find it, because of course you're not really looking. You don't really want to know. You want to be fooled." Glad that you enjoyed the quiz! Hi Sonia... I'm thinking these may be trickier than I realised. It's so easy when you have the answers!